In 2014 ESPN Cricinfo carries a basic ball by ball record of every County Championship fixture, as well as a link to, for most, a local BBC radio station that is broadcasting from the match. I haven’t heard too many expert summarisers, but the men, and at least one woman, who provide the commentary do a perfectly competent job. What it is not yet possible to do is watch the game from wherever a connection can be obtained, but as a Lancashire supporter I can view the wickets that fall in the County’s matches on youtube, via helpful links that arrive all but instantly from the club’s twitter feed. It is a far cry from the not too distant past, and light years away from the few seasons just after the war when the county game enjoyed what was, in terms of spectators paying to watch matches, its most successful period. It was an age of severe austerity, the nation all but bankrupted by its efforts in the Second World War. Much was still rationed, but professional sport no longer was and with, by 1947, wages having risen about 30% above their pre-war levels, many more people could afford to go and watch the cricket than had been the case in the past. Few remembered the first post-war season of 1946 with a great deal of fondness. The weather wasn’t particularly inspiring, and the Indian tourists did not have a very happy time. Many of the counties struggled to get sides together of the requisite quality and it was a year of marking time, and getting used to the old way of playing the game, of three day First Class matches. The English game is nothing if not resilient however, and the following year was very different indeed. There was a visit from a strong South African side, that contained fine batsmen like Bruce Mitchell and Dudley Nourse who are still revered today. Less well remembered is the tourists’ skipper, Alan Melville, but perhaps he deserves a reappraisal. His overall Test average is north of 50, and he was always recognised as one of the most elegant and fluent batsman in the game. The South African attack contained a couple of fine finger spinners as well. Who knows what Athol Rowan might have achieved had he not suffered his wartime knee injury, and the tragic death at just 31 of slow left armer Norman “Tufty” Mann prevented him from making a more lasting impression on the record books. In truth the weather in May 1947 wasn’t any better than it had been the previous year, but as the end of the month drew close the sun came out, and in the memory of those who had the pleasure of watching any cricket that season, it didn’t set again until October. Two men above all others shone with a remarkable brilliance through those balmy days, the so called “Middlesex Twins”, Denis Compton and Bill Edrich. Compton set a record for the most runs in an English season that will never be broken, with 3,816 of them – a modern batsman would be happy enough with that tally over three summers. The old record, set by Surrey’s Tom Hayward 41 years previously, was beaten by 298. For good measure Edrich bested Hayward as well, albeit by just 21, as he ended the season with 3,539. Hayward had 61 visits to the crease, and averaged 66.37. Edrich had 52 innings and averaged 80.43. Compton had just 50 opportunities, and averaged 90.85. The Test series was won 3-0 by England, all the victories being by convincing margins, but the series was rather closer than that suggests. The first Test ended as a draw with the visitors 61 short of victory with nine second innings wickets standing. When the final Test did likewise, chasing a distant 451 for victory, South Africa ended up just 28 runs adrift, with three wickets still to fall. Had the Tests been of five days duration rather than four then it seems inevitable that the eventual margin would have been 3-2, a rather more realistic reflection of the respective strengths of the two sides. The difference, inevitably, was Compton and Edrich. Compton scored 753 runs at 94.12, although he didn’t top the England series averages where, for once, his twin came out on top. Edrich, who missed the final Test, averaged a Bradmanesque 110.40. Compton didn’t fail to get off the mark all summer, and only five times was he out in single figures. His worst performance came at Lord’s against Yorkshire, when he scored just 4 and 15. At that point, after a slow start, he had made five centuries and was averaging a tick over 70. It was the end of June. There were 17 matches left for Compton and he recorded thirteen more centuries to give him eighteen in all, two more than Jack Hobbs’ record. His last eleven matches brought nine centuries, and in the two matches in which he failed to reach three figures he scored four fifties – he must have been disappointed to say the least when the season ended in mid September, as the sun continued to shine for another fortnight. But it wasn’t so much Compton’s weight of runs that charmed the nation as the way in which they were scored. He was one of the most attractive and stylish players the game has known. His 2 lbs 2 oz bat was a wand rather than a bludgeon. In an article written for the 1948 edition of Wisden ‘Crusoe’ Robertson-Glasgow wrote Compton is poetry; Edrich is prose, robust and clear. Both men, as well as their Middlesex teammates, always scored at great speed. Skipper Walter Robins seldom wanted to bat much past 5.00pm on the first day, so the pressure was on to get runs quickly. The side’s openers were Jack Robertson and Syd Brown. Robertson managed 2,760 runs, and matched Edrich with twelve centuries. Brown got past 2,000 as well, so the twins weren’t the only Middlesex batsmen to have memorable seasons. There were other factors at work as well as the undoubted batting talent that was on display. Firstly there were the wickets. As Compton said years later the pitches in England then were beautiful. They were hard and fast and the ball came on to the bat. You were certain of the bounce and pace of the ball. Perhaps more importantly, certainly in terms of the speed at which batsmen could score, was the attitude of the bowler. Using Compton’s words again, they bowled to get you out. They used to bowl off stump to a field split six-three. It would not be long before the standard of English pitches declined markedly, and bowlers who were under the cosh would take to adopting a negative leg stump line, and limit their ambitions to slowing the scoring rate. The over rates helped too, as did the absence of gamesmanship. In one Championship match Middlesex needed 66 to win in 25 minutes. They succeeded after seven overs with four minutes to spare. A modern team would be unlikely to bowl more than four overs in 21 minutes if the ball was flying around. It is also worth stressing that not everything was loaded in favour of the batsmen. The season’s First Class averages show that as many as sixteen bowlers took their wickets at a cost of less than 20 runs each. Top of the list was Glamorgan’s 49 year old off spinner, Johnny Clay, who in a year’s time, having celebrated his half century, took the wicket that clinched the Welsh county’s first title. Second behind him was another veteran off-spinner, 46 year old Tom Goddard of Gloucestershire. Of the six bowlers who averaged under 18 only another veteran, Yorkshire’s Bill Bowes, by then 39 and down to not much more than medium pace after years in German captivity, was not a slow bowler. In 1947 there was, in relative terms, a dearth of pace bowling in England, and the odd exception like Alec Bedser and Trevor Bailey apart, those there were had, like Bowes, debuted before the war. Compton himself observed There was nobody really quick in England then. The finest pace bowling that Compton did see was from a man who, like himself, has a grandson playing county cricket today. Maurice Tremlett of Somerset made his First Class debut against Middlesex, and despite playing on for more than a decade it remained his most memorable match as his lively fast medium bowling played a leading role in a rare West Country victory at Lord’s. He took three first innings wickets before setting Middlesex on the road to defeat in their second knock with a spell of 5-8, including Compton for 25. To add to the achievement Tremlett, batting at number ten, scored the winning run as his side won by a single wicket. It was enough to get Tremlett on the 1947/48 tour to West Indies, but he enjoyed little success there and in the latter part of his career was purely a batsman, his bowling skills having deserted him completely. The Championship title was won, unsurprisingly, by Middlesex. All but two of their 26 matches had a definite result, nineteen of them wins. Gloucestershire, mainly courtesy of Goddard’s 238 wickets, ably backed up by the 144 of his twin, slow left arm bowler ‘Sam’ Cook, were runners-up. But even as Compton was conquering everything the bowlers of England and South Africa could throw at him, the 29 year old’s career had peaked. The game when 66 were chased down in 21 minutes was against Leicestershire at Grace Road. Compton scored 151 at a run a minute in the Middlesex first innings, but such was the camaraderie between the teams at some point during the match Leicestershire’s Australian born all-rounder Jack Walsh showed Compton how to bowl the chinaman and googly. Before that match Compton was no more than an occasional purveyor of orthodox slow left arm, but the dark art of wrist spin appealed to him. He repaid Walsh’s kindness by taking five wickets in the Leicestershire second innings, and then against Surrey at the Oval there was a remarkable victory for the eventual champions. In brilliant sunshine a large Saturday crowd watched Middlesex pile up 537-2 in 118 overs. Compton and Edrich’s unbroken third wicket partnership was worth 287 by the close. Robins declared first thing on the Monday morning and Compton then took 6-94 and 6-80 as Surrey failed by 11 to avoid an innings defeat. He had been bowling in his new style for less than a month. He ended the season with 73 wickets at 28.12 and his career with a total of 622 victims at 32.27. His bowling was clearly a significant asset, although true to his personality Compton always laughed it off, explaining that the wickets came when he caught batsmen in a quandary, unable to decide whether to hit him for four or six. Sadly the birth of Compton as a more than token bowler coincided with his starting to have real problems with the knee that had been damaged on the football field back in 1938, and there were occasions late in the season when it needed strapping to enable him to play at all. In the final Championship game of the season whilst bowling against Lancashire the knee locked for the first time, not that it stopped Compton scoring a century and taking five wickets. So even in this, the greatest of all individual seasons, Compton wasn’t in peak physical condition throughout. And what of Compton’s much maligned running between the wickets in 1947? He himself wasn’t run out at all, and neither was Edrich. 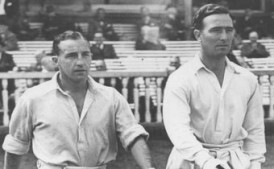 There were a few disagreements between them at times, but that was inevitable given that Compton himself admitted many years later both of them enjoyed their batting so much that summer they were constantly trying to outdo each other by taking quick singles at the end of an over in order to stay on strike. The richness of Compton’s vein of form is best illustrated by his batting in the final match of the season, a then traditional fixture at the Oval between the Champion County and The Rest of England that extended over four days. The Rest generally prevailed, but in 1947 Middlesex won by nine wickets, by far the most impressive winning margin of the three occasions on which, to that time, the Champion County had won. Compton, the pressure off after breaking Hayward’s and Hobbs’ records in the previous match, made his highest score of the summer, 246, against a Test class attack. At one point he went down the wicket to Goddard and in doing so caught a spike causing his feet to lock together, making him fall forwards. Such was his form and fortune that summer however on the way down he managed to wave his bat at the ball, middle it and sweep it for four. Self-effacing as ever Compton’s own verdict on 1947 was that Once I had got started everything seemed to go right for me, every kind of shot even if weird and unheard of was a surprising success. At cricket when your luck is in it really is in. In truth of course there was rather more than luck involved. Great skill, good weather and sporting opponents were needed as well. In 1947 all four were present, consistently for almost three months, and the result was what remains the finest summer the English domestic game has ever seen.